This month in #Otherworldly Words, I am exploring words to do with fear. 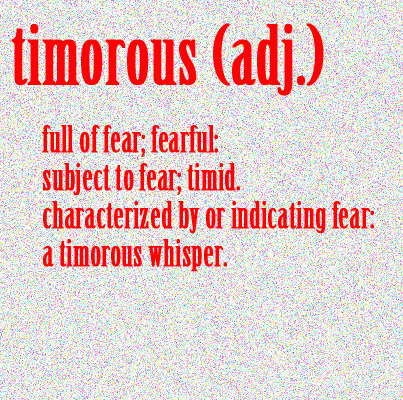 Timorous continues the path of words that cast contempt on those who show fear. Exploring the nature of fear is important. Certainly, fear has many natural components, survival instinct and adrenaline for instance. But the meaning we place on fear as a society is equally strong if not more so. In wars, we have shot men for cowardice or imprisoned them for treason. Fear is a strong motivator. Fear unchecked has led to wars and unjust imprisonments. But fear too often maligned can have the same result.